I have this small nightstand-sized lamp that I’ve had for more years than I can remember. It’s not an expensive lamp, just something from Target. The lamp is still in good shape, but the shade is starting to show its age. So, I decided to revamp the shade instead of buying a new one. I have to say I love how it turned out. 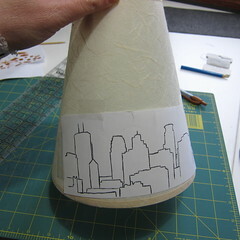 I knew I wanted to do a cityscape, so at first I thought of just embroidering something on the shade like the ones I saw in Sweden last year. But I really wanted to play more with the light. The solution was simple, just make holes to create the design and let the light shine through. The shade I had wasn’t really the perfect shape for this project. It was a cone, so the design can’t really lay flat, it has a little curve to it. 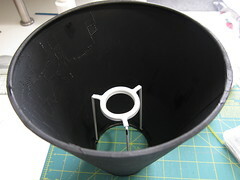 A barrel-shape would have worked better, but the idea was not to buy a new shape. Then there was the problem of color. My shade was made of off-white paper, so when the light was turned on it let too much though and took away from the drama of the light through the holes. My solution was to paint the shade black. This solved the problem easily, though I did have to go back and poke some of the holes again because they had paint in them. If I did this again I would paint it before adding the design. 1. 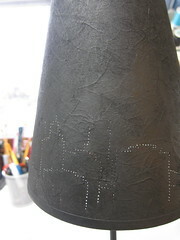 If want to paint your lampshade black like I did, do that first. It may take two coats to get in completely opaque. I painted the inside of my shade as well, because I thought it looked better. 2. Print out or draw the image you want to put on your shade. Make sure it isn’t longer than your shade is around. Tape it to the shade. You want to make sure it is pretty secure and flat to the shade. 3. 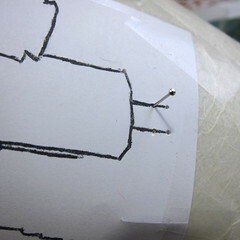 Use the pin to poke holes through the design and shade. I twisted the pin around a bit in the hole to make it the slightest bit bigger. I spaced my holes about 1/8″ apart. I tried to always make sure there was a hole at the corner of each building and end of each line. 4. Remove the taped on paper and, if you painted, touch up any paint. Enjoy your new statement lamp. I love that. It’s so cool! I love that! Great idea. Since your holes would need to be slightly larger than a pin. I wouls use the tip of an awl which would make the holes a nit larger and give off light but not so much it would ruin the effect your going f or. That would work too, but not everyone has an awl on hand and most people have straight pins. I love this idea and this is a great idea to make for my secret Santa! Did you just look up skylines on the Internet? 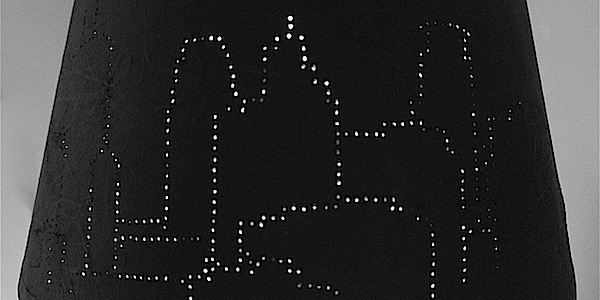 I just found a photo of the Minneapolis skyline online and traced the outline. You can pretty much find one for any city. How cute is that! I am sharing this on Pinterest! The possibilities are endless!! 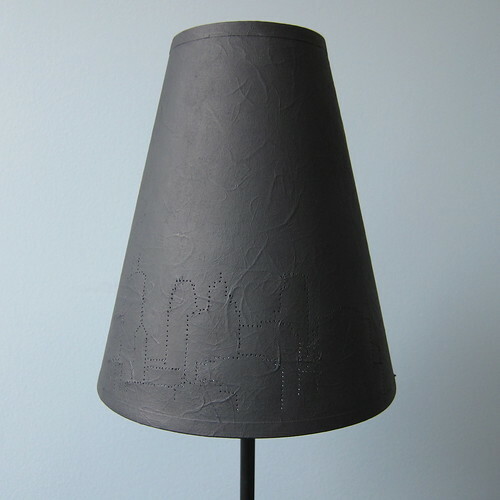 Pingback: 14 Crafty DIY Lampshade Ideas. Is The Most Creative I’ve Ever Seen. What if we paint at last?? If you paint it last, I think you run into the problem of paint filling the holes you just took the time to make. I love love love this lamp. My daughter is going to college in the fall. 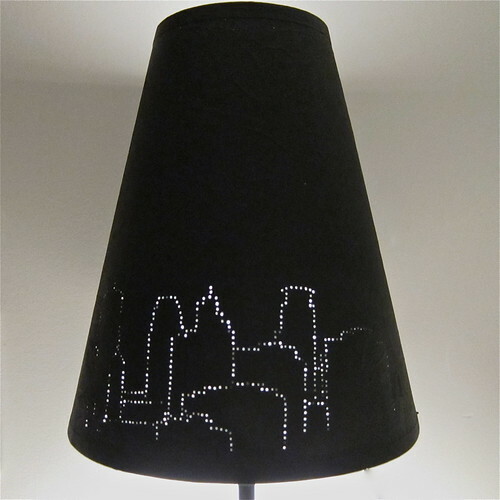 We live south of Pittsburgh PA and the skyline would look great. It will also remind her of home. Thanks for sharing. Great job. So glad you like it. It is such an easy project, but really makes and impact. Do we do it all the way around the lampshade or just that one section?